Hey! My name is Bernardo Cristovao and I’m a Character Artist currently working at Jagex, for their flagship title – Runescape. My journey through the world of game art and 3D started few years ago, in the same day I graduated from the Faculty of Fine Arts of Lisbon with a degree in Drawing! I wasn’t completely sure about what I wanted to do professionally when I started uni – I was leaning towards 2D illustration or something like that, but because the course was quite generalist, I ended up having some digital art classes, which introduced me to ZBrush. I was super excited about the software at the time, so I started researching about the CG industry and spending countless hours looking at amazing art at CGSociety and ZBrush Central galleries, and this got me really hyped about the industry and made me want to do 3D art for a living. Right in the same week I graduated, I scavenged for as many online tutorials I could get to learn Maya and ZBrush – Digital Tutors online tutorials helped me a lot learning the basics of both softwares and helped me come up with my first personal pieces! In that same year, Trojan Horse was a Unicorn announced their first edition. I was completely blown away with the lineup of speakers, some of them were my idols at the time, so I couldn’t miss it for anything, especially because it was happening in my home country and close to where I used to live! This festival had a huge impact on my learning curve. I was really lucky to meet a bunch of great artists, got a lot of good advice and portfolio reviews. I also won a Gnomon online ZBrush class, through one of the raffles they did at the festival, and that opened so many doors. Right after THU, I took the Gnomon Digital Sculpting class with Madeleine Scott-Spencer, who had just been working for The Hobbit. The classes were super inspiring and I was sculpting in ZBrush every single day of the week. Each of the students had to work on a final project, and I was lucky enough to win a CGBadge at CGSociety with my final project and made it to their “Featured art” gallery. That CGSociety award opened the doors to my first 6 month job experience as a trainee character artist in Lisbon and after that, to freelance work. 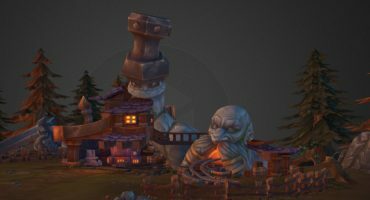 I was still eager to learn and improve my knowledge in 3D art, so I started investing the money I was earning from freelance work into online training, which I have kept doing until pretty much today. Tyler Breon, Gilberto Magno and Bruno Camara were my instructors in the following courses I took. Each of them really helped me learning more about art, the industry and all the steps in the character art pipeline. 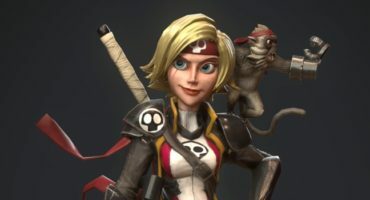 After the first class finished, Brushforge announced they would be teaching their first character art class in a few months. I enrolled for this one as well! Because I had built a very strong narrative for the “Wrath Bringer”, I thought it would be awesome to use it for a character too. When I’m modelling a character designed by me, I always make an effort to start with strong foundations, by that I mean: strong references and narrative. I used to get stuck a lot when concepting my characters either in 2D or 3D. With time I realised this was mostly happening because I wasn’t spending enough time defining a good narrative about my character. I believe a strong narrative will guide and help you finding appealing and believable solutions for your design. How did this apply to my character? I knew I was going to invest a lot of time in this character, so I really wanted him to resemble my favorite games, books, soundtracks and movies/series.
. Vikings (the TV series) – Ragnar and Bjorn! After this, I assembled a Moodboard with a bunch of visual references. This helps me to set the mood, color pallette, patterns and design choices whenever I move to the concept stage. Usually this is where the hype starts for me, having a strong list of references and a good moodboard helps me come up with ideas a lot more easily! Disclaimer: I do not own any of the amazing images shown above. After a good brainstorm, I move to the narrative and write a small list of keywords. Keywords always help me narrow the main aspects I want to show off in my character – the things I want people to identify at first glance and somehow help in telling the character’s story. “The planet of Derwen has always been famous for its dense forests and fantastical creatures, but what makes it really special and iconic, is its ancient giant tree that through its enormous roots and the power of the magical crystals embedded in its wood, “fuels” and feeds all Derwen, as a living being. Recently, evident signs of a dark and evil force started to show in the forests and rivers. The dense forests that used to shine bright greens, yellows and browns are now turning mud, dark and … corrupted. There’s no telling which creatures are friend… or… foe. The woods used to be quiet and safe … but not anymore. Once I’m done with these I’m good to start drawing ideas! I always start by designing my characters in 2D. At this stage I focus on trying to get sketches of my character with most of the elements that I want to translate to 3D. I wasn’t looking for something spectacular, but something I could work from in ZBrush; this really depends on the project and from person to person though. I knew I was going to adjust my design once I moved to 3D and the concept part of it in 3D, so I kept it fairly simple. In the axe, for example, because I was going to model most of it in Maya, I wanted to make sure I had very well defined line art that I could import to the viewport and use to model on top of it. Here are the initial designs I did for my character and how I tried to communicate its narrative. The shoulder pad was something that arrived quite late in the design stage, but I’m really glad I found it, because it really helped selling the narrative of the character. Having a “wolfy” shoulder pad could open the door to a lot of narrative possibilities, it could easy relate to the character’s past, or to his origins. Maybe he comes from a tribe that worships the wolf, but only its mightiest warrior could wield the shoulder pad and axe. Wielding both these items would grant its carrier super abilities, like super speed, super vision, super strength, etc., etc., which would be really cool from a gameplay point of view! In the image above are the initial sketches I did for the axe. In these initial designs I realised I was going towards a more “aggressive” look in terms of shape language, which didn’t make much sense. Iron Wolf is meant to be a dwarf & Viking inspired character, if you look at most designs from both genres, they all seem to use straight lines and patterns. To start sculpting my character, I grabbed the ZBrush default human base mesh: “NickZ_humanMale”. Due to its proportions and even topology, I find it great to start blocking the proportions of my characters. I don’t use this basemesh all the time, as every character may require a different approach, but generally, basemeshes can really speed things up at this stage of the project. You can find tons of good basemeshes in online platforms like Cubebrush, Gumroad, etc. Above you can see my character’s anatomy. Because I knew he was going to be mostly covered by clothes, I didn’t aim for something too detailed, but just for basic proportions and something a bit more stylized. I tried to make a bulky, wide and short kind of body, something that could convey the dwarf feeling I was looking for. This was all made using very basic brushes like: Inflate, Move topology, Orb cracks and pinch. After blocking the character’s anatomy, I started building his clothes and refining his design. My initial character sketches had pretty much all the elements I wanted, but only when I moved to 3D, was I able to test if they were actually functional or made sense at all. You can see some differences between the initial designs and the model. My main intention was to have the wolf and hunter theme as the focal point – the shoulder pad, the wolf buckle, the fur on the long coat, the fangs on his boots and earring, the long beard – these were made to resemble those two themes. The character’s face also needed to have a big impact and make the character recognizable at first glance – I knew that the big beard with the metal rings would help me with that, as it’s a fairly common characteristic among dwarves and vikings. The rest of his outfit is quite plain – leathers, more leathers and a long cape – pure hunter/ranger elements. I also thought it would be fun to add a piece of fabric to his left arm that could somehow tell a small story – e.g., it was given by his wife on the day of his departure on his epic adventure. 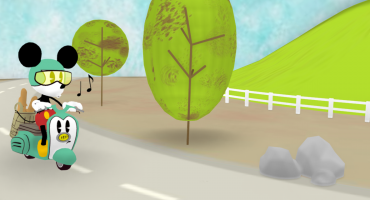 You can find the IMM_Hair brush here. And Orb Cracks here. The lowpoly stage was definitely the most exhausting one. It’s that part of the project that you just want to get done and move on to the fun part – texturing! As I opted for a sort of “Next gen handpainted character”, I had loads and loads of little floating pieces to retopo, like: scales, fur, hairs, belts – I decided not to optimize these parts to make sure that I got the best detail and resolution possible on my character. The lowpoly mesh changed a bit compared to what it was initially. To help translating the idea that he’s a dwarf, I made his beard and boots bigger. I also exaggerated the size of his top knot and other elements – just because I like “chunkiness”. The axe was 90% modelled in Maya and 10% in ZBrush, which I only used to make the floating straps and the fur. For texturing I used 3DCoat and Photoshop. Although I spent a good deal of time on my sculpt, I ended up not baking any maps from the highpoly. I really wanted to learn and improve my texturing skills in this project, so I painted all from scratch in 3DCoat, starting only with an Ambient Occlusion map generated from the lowpoly. I didn’t set any base colors on my concept art, so I kept adjusting the color pallette along the way – I believe this is something you should always do, if necessary. For the axe I did a colored concept art, so after I baked the AO map in 3DCoat, I picked the colors from it to lay down my “foundations”. In terms of pipeline, I usually start with: Ambient Occlusion Bake, Base Colours in Hard Light mode and a nice top-down black and white gradient in Soft Light mode. After I’m done with these “guide” layers, I focus on rendering each material. I wanted my character’s focal point to be his face and the shoulder pad, so I tried to keep the lower part of his body with darker values and less color variation. I knew this would help me keep a nice gradient and focus more attention towards his face, beard, hair and shoulder pad. I was very lucky to have a Character Animator friend that offered his help to rig, pose and animate my character: Sebastião Lopes. We worked together multiple times when I was freelancing in Portugal, so having him working on this project with me was a lot of fun. – Character reel – A very short movie with turntables and animations, all working in a real time engine! Having Sebastião Lopes helping me out with the poses and animations was great, because it meant I could focus exclusively on the character’s presentation. As soon as he would finish a pose I would be instantly plugging it into Sketchfab and Marmoset Toolbag, to make sure that everything was working properly. To make the beauty shots and the reel, I used Marmoset Toolbag. The reason why I did that, was because it’s a real time engine, which means that the character is “game-friendly” and will certainly work properly in a game engine. After exporting each character’s animation, I composed them in After Effects and added a nice soundtrack to help sell the mood. Sketchfab is an important part of my pipeline – I absolutely love it and have been using it actively for the past two years. When it comes to both personal and professional work, my goal is always to present my characters in Sketchfab, either when they’re 100% finished or along the way to share them with artist friends to get their feedback. Most of the time I use Sketchfab to make my high resolution beauty shots, using “Screenshots” from Sketchfab’s “Labs Experiments”. All the other beauty shots from handpainted characters you see in my Artstation page were exported from there – it’s really easy to do and I totally recommend it! To set up Iron Wolf’s sketchfab scene I used very simple settings – because I wanted to showcase the textures exactly how I painted them, I’ve set the scene to “Shadeless”. I tried to get a nice background to help fit the character into the scene! After that I always like to play around with “Post processing effects” (these are the best). – Bloom – if you’re using Emissive maps, definitely play with the Bloom option, it really helps you achieving nice effects and bumps the metals! Hope you liked my artist spotlight. If you’re curious about my artwork and want to see more, feel free to follow me here on Sketchfab and Artstation. If you liked the character poses and animations, feel free to follow Sebastião Lopes work too!